Well, today was “The Day” to find out just where we’re at with my radiation treatments. I don’t know exactly ‘what’ I was expecting, but sort of felt ‘down’ after getting the results. What are the results? More radiation – same old kind for another week but keep a watch on the ‘sunburn’ area. I asked about “The Boost” and, honestly, I really don’t remember ‘what’ the doctor said except that my body is reacting exactly opposite of most other peoples, therefore we’re going back to ‘the basics’. Sigh. My energy level is about the same – not as good as it used to be, but I’m still able to do the things I want/like – just a little slower and with more breaks to rest! Driving around today I was a bit shocked at the gas prices – it seems to me in years past that gas prices went UP on the holidays, but not this year! Last week I was seeing prices which went from $3.39/9 a gallon the week before to (lowest I saw) $3.10! Tonight they were back up to $3.39/9! Strange! Just observing . . .
Not much else new; am starting another knitting project. While at Knit Night last week one of our members came in with a big bag full of ‘fun yarns’ and gave it all away. Normally I wouldn’t be interested, but there were 4 balls of this strange ‘fancy’ yarn done in various shades of pink to white mixed with a very different sparkly ribbon in reds & silvers (sounds hideous, right?) I got this idea when I woke up that this might make an interesting Christmas present for our pastor’s wife (the one who just got diagnosed with uterine cancer). It’s bright, fun, cheerful – hoping she’ll like it (if not, she can re-gift it to someone else!) I just tried finding a photo of this yarn on the company site that makes it; I’m guessing it’s no longer made as there was no record of that yarn on their site. Because this is one of those ‘fancy’ yarns, I chose to knit it using large needles (size 11) and a very simple pattern; it’s about 1/4 th done after working on it just today! garlic salt & pepper. Bake chicken 12 minutes. salad; sprinkle with onions & almonds. Grease baking sheets & set aside. in small bowl; sprinkle some flour over them. serving. Makes about 4 dozen. clean. Cool on a wire rack 10 minutes. Eggnog Glaze over cake. Makes 12 servings. cooking spray. Bake 8-10 minutes. from sheets. Makes 3 dozen. set aside in cool place. to serve, cut with hot knife. MICHIGAN – land of LOTS of snow! Here it is Saturday already – how was your holiday feast day? Ours was very nice, a little late, but that’s due to me slightly forgetting how long it takes me now to accomplish tasks (do something, rest, do a little more, rest, etc.). I think, so far, of all the things that ‘could’ bother me about my cancer, the one thing that really gets me is the fatigue and how it sneaks up on me when I least expect it. (sorry for going on & on). Quick update: I’m currently on a break from radiation – I’ve developed an infection at the surgery site. I didn’t even know you ‘could’ get this type of infection in that area, but I’m told anywhere that has moisture can get it. I’m on three types of topical medications and now, as of today, on an oral antibiotic, as well. The risk, I’m told by the head of the radiology department, is that if this infection gets into the surgery scar, it can cause multiple problems and make me very sick very quickly. I go back Monday to have the doctor look at it and he will decide whether I continue radiation or take a longer break. Ah, the fun of it all, eh? remaining 2 T. toffee bits. until bubbly and golden brown. in bottom of a baking dish. banana, milk & banana liqueur in a bowl. over top of cake. Makes 18 servings. Stir in half Velveeta & 1/2 C. salsa. is well blended, stirring frequently. melted. Top with sour cream and cilantro. 8 oz. wide egg noodles (half 16 oz. of cheese and half potato chips. I know I’ve posted chemo caps before that look a lot like the pink one above, but this one (I think) is my all-time favorite. It doesn’t show in the photo, but this was done with a very soft rose color – it looks closer to the real color in the chemo caps photo, that’s the one on top; it went very well with the last bit of color-changing yarn from another skein (you’ve seen me use this yarn in several hats before). 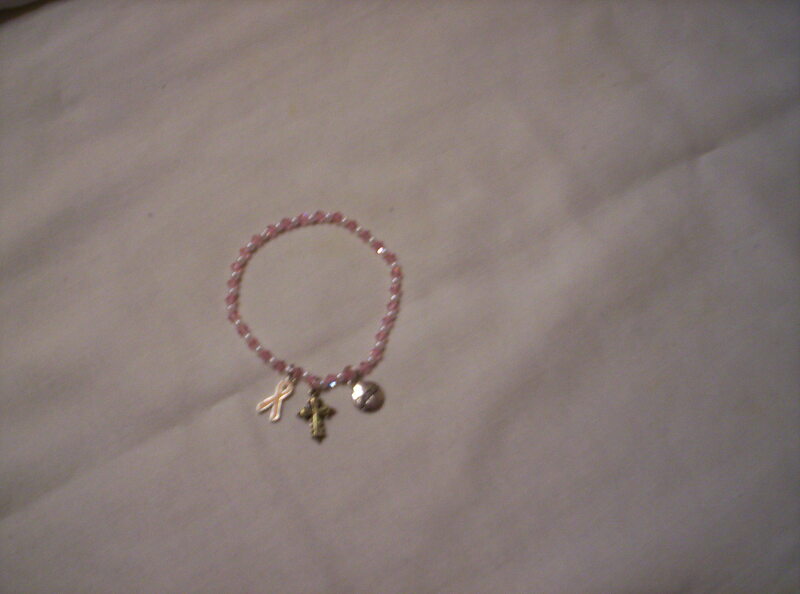 I didn’t leave enough room under the photo of the bracelet to explain the charms: first there’s the pink cancer ribbon, then a small cross, then a small silver circle with “Jesus” in the center. The beads are Swarovski pink crystals and tiny pearls. Anyway, that’s what’s happening around here this day – it’s another unseasonal 58 degree day – a little grey & gloomy, but still really warm for this time of year! May you have a . . .
Just a Few More Recipes . . .
Today is the ‘day before’ the big feast and my ‘in box’ is still loaded with great holiday recipes so I thought I’d share them ‘just in case’ you might have the need for another side dish or dessert. So far today I’m doing the ‘work, then relax’ thing – got the sink totally cleared of dirty pots & pans, loaded and ran the dishwasher, finished another chemo hat and began about 2 inches of a new one – now I’m on here writing to you. Going to be a good day – relax/work method works for me! pan to a depth of 1- 1/2 inches. ice cream, if desired. Serves 10.
on low speed until well blended. completely dissolved. Stir in cold water. 30 seconds, then medium speed 2 minutes. (do NOT overbeat). Spread over cranberries. crunch in this slow cooker recipe. soy sauce and milk (if using).Toss beans gently to coat. the topping), melted butter and egg. and sprinkle on the pumpkin filling mixture. Combine bread, spices, celery and onion. on low for 4-5 hours. and salt in mixing bowl; beat well. Pour into greased 9 x 13 pan. and refrigerate) Makes 12 servings. 1 (8 oz) pkg cream cheese, room temp. and cranberry sauce; stir to incorporate. top. Keep chilled until serving time. in potatoes and place in a baking dish. melted - about 15 minutes. spices. Stir this into the pumpkin mixture. completely then wrap and refrigerate. dish sprayed with non-stick spray. foil with cooking spray; set aside. and stir over low heat until melted. the Lord has sent your way. Fall day today - 43 degrees and SUNNY! Today finds me resting (sort of – ); went to my treatment and met with my Radiologist – apparently they are going to change my treatment (and give me Friday off! ); I’m starting to show signs of the radiation ‘sun burn’ and they’re concerned. I came home with two prescriptions, a tube of hydrocortizone cream (for itching) and a burn/itch spray – we’ll see how that works. I was also surprised to hear the doctor (not my regular one, this is the head of the Radiology department) say that I only had something like 6 treatments to go – I know I should have questioned him but it just left me shocked. To MY knowledge, I have 15 more to go! 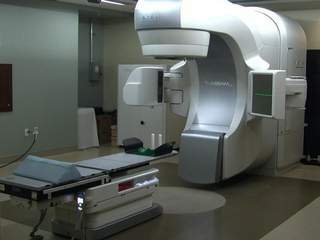 He mentioned they might skip the regular treatments and just go to what they call “the Boost” – apparently it’s a more concentrated radiation aimed specifically at where the tumor was. It’s all new to me – I’m just going to wait and see what happens! enough to handle, about 3 minutes. be a bit warm) into 3 inch rounds. in a large oven roasting bag. into a crock or dish & refrigerate. 8 1/2 x 4 1/2 x 2 1/2 inches. Heat oven 200 degrees F.
mixture is very stiff & shiny. desired); beat for 1 minute. cranberry into top of each cookie. completely before removing from pans. loaf pan or three 3 x 5 loaf pans. extract, sugar, vanilla and butter. for 10 minutes & remove from pan. and cook until just heated through. Serves 4.
pecans and melted butter in bowl; blend well. with turkey, chicken or ham. juice. Add carrots; toss to coat. Garnish, if desired. Serves 6. I Earned My “Keep” Today! Today was the beginning of the ‘grocery shopping rush’ and I certainly got off to a good start! First thing was the ‘daily radiation’, then stopped at our local Gordon Foods (store my son used to work at) for (our usual) 5 lb. container of sour cream, large bag of corn chips, loaf of wheat bread and ‘the goodies’: a large pumpkin pie and the big assortment of various cheese cake slices (YUM!). Oh! Almost forgot my one ‘impulse buy’: they had something I’ve never seen before: Cinnabon Cinnamon Bun-flavored candy canes! (couldn’t resist: something like $2.99 a box). My husband is our family’s cinnamon freak – forget those peppermint candy canes or any other flavor – it’s got to be cinnamon (and, believe me, that flavor is getting harder & harder to find each year!). Even though I don’t care for all the SWEET flavor of a candy cane, I just might be tempted to break off a piece and try them (after Thanksgiving, of course!). Next was a quick stop at our little local grocer (they have great produce!) – right now I really don’t remember what I got there! Vaguely remember Stove Top stuffing on sale, Campbell’s turkey gravy (I know I bought other ‘stuff’, just don’t remember!). Came home and took about a 45 minute ‘rest’, then it was off to my general physician for my 3 month check up. (this cancer thing is a pain – makes me have to go to my regular doctor every 3 months AS WELL AS the Oncologist/Radiologist, etc.) It was OK, though, because I ran into my other ‘second year resident’ doctor whom I hadn’t seen in 3 months – he even gave me a big hug! (He’s the one who gave me the initial diagnosis of breast cancer – really REALLY nice guy, married and expecting their second daughter!). Check up was really good, awaiting blood tests to see if all my vitamin/mineral levels are OK (that’s the thing with radiation – it can make you anemic and have brittle bones); I asked today about exactly what vitamins & minerals I should be on – he said what I’m doing now is fine but we’ll see exactly when they get the blood tests back. Tomorrow night is also my Knit Night so I know I’ll have to conserve some energy for that. I’m finishing up another chemo cap (4 more to donate – NO PHOTOS, they all look the same, just different colors). Am also working on a regular worsted-weight yarn hat to donate to our special needs group’s “Giving Tree”. It’s a candy-striped red & white hat, for either a man or woman. The group puts up an artificial tree in the church foyer and people donate hats, mittens, gloves, scarves and socks; all proceeds are donated to the church’s outreach to the poor people of the local area. breasts, cut into bite-sized pcs. and garlic powder; pour over chicken. minutes or until chicken is done. spinach between 4 serving plates. on a wire rack; remove from pan. tablespoon yogurt. Makes 8 servings. brown; uncover and cook 30 min. more. extra grated cheese for topping. pour over bread mixture & toss to coat. recipe – it makes them softer. cream in crust. Freeze until solid. bottomed saucepan, combine sugar, flour & salt. fold in confectioner’s sugar & vanilla. Swirl mixture over top of cooled & set pie. has blessed our family this year. For those of you who know me well (and anyone new to the site) – I’ve been having a BLAST comparing grocery store sale ads ON LINE! Don’t know why I never did this before, but (if you read the previous blog you’ll understand) THIS YEAR I’ve waited for the proverbial FROZEN TURKEY SALE for the past two weeks! Usually our mailbox is inundated with various local (and national) grocery store ads all vying for my attention with various sale items for the Thanksgiving holiday. Yes, it’s great to get a name brand boxed stuffing mix on sale, but your biggest expense for this particular holiday is THE BIRD! Last week I was checking around and didn’t’ find any sale turkeys for less than $1.49 (not exactly sure, but it was over $1.00 a lb.) a pound. In years past I’ve paid something like $.59 a pound, maybe even less but I’m CERTAINLY NOT paying over a dollar a pound – not when I expect to buy a turkey in the vicinity of 18-25 lbs! (We’re a small family – counting my son, his girlfriend & my grandson, we come to 7 people BUT we LOVE OUR LEFTOVERS!). Turkey is one of those meats that not only tastes good the day it’s cooked, but it’s a very versatile meat – you can use it by itself, as an ingredient in many different casseroles AND it can be frozen! To sum up my little ‘rabbit trail’ subject, I’ve been comparing four local grocery stores and finally came up with THE WINNER! A local store which sells Spartan brand products (and we have two of them very close) is offering their brand turkeys for $.49 a lb. if you buy $25 of other products. I thought that was the be all/end all (their only restriction is it’s LIMIT ONE). OK – I forsee myself buying their required amounts and coming out with a nice turkey but I always buy TWO turkeys- one for Thanksgiving and one for Christmas! Aha! After checking our local Kroger ad for this coming week, Kroger is offering their ‘house brand’ Riverside USDA Grade A frozen turkeys 18 lb. and up for 39 cents a pound, limit 1 with extra $10 dollar purchase! YES! SCORE! 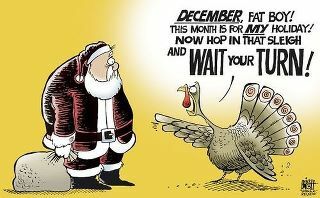 I’ll get the bigger turkey at Kroger, and a smaller one at the other store! YES! (I love hunting out a good bargain!). By looking at the various local grocery store ads I was able to deduce that the store with the .49 cents a lb. offer has a TON of various items I would normally buy for this holiday, which makes the ‘spend $25 extra’ a breeze! I should add that I’ve never shopped this store before but heard glowing reviews from friends. Why, you ask, haven’t I shopped there before? Because it’s about 15 minutes from my house; the only reason I happened to notice their special sale is because I was stopped at a traffic light earlier today on the way home from my radiation treatment. I’m anxious to see just what that store is like: is it clean inside? Are their normal ‘sales’ worth the extra drive? Is it easy to get in and out of their parking lot? What about availability of shopping carts? Ease of traversing their aisles (or are they crowded with those ‘sale’ item displays that seem to be put RIGHT IN THE MIDDLE OF THE AISLE!? They seem to be waiting to be knocked over! A few weeks ago I got into a discussion with the grocery person in the fruits & veggies aisle at another store; I chose to ask him about a particular product that was on sale that I couldn’t seem to find. There was a GOOD reason I couldn’t find it – they had stuck it UNDERNEATH the backside of one of the produce racks! You would only see this if you were (a) looking down or (b) BENDING DOWN or (c) just happened to walk around the backside! I was polite but pointed out that this was NOT a good spot for that item! Next time I was in that store I noticed that they’d moved things from under the rack – now it was a storage area for extra products – much better use of an area – Who’s going to buy that product on sale if they can’t SEE IT!??? How many people actually ASK for something they can’t find? Not if it’s a crowded ‘holiday shopper packed’ store, that’s for sure! Anyway, that’s my ‘rant’ for the day – looks like I’ll be stopping at a total of 4 stores for holiday goods: our local Gordon Food Service store (a mostly Michigan based large item store) for another 5 lb. container of sour cream (we go through a ton of it) and one of their many wonderful/very tasty/dessert offerings. (for the last two years we got a variety cheesecake box: something like 16 large slices of cheesecake in 4-5 different flavors). This store is also known for desserts that nicer restaurants purchase from; good stuff! (a little expensive but worth it). Next comes good old Krogers for their 39 cent turkey & $10 extras purchase; following that is a tiny local grocery that has a few things worth the extra trip, like Stove Top stuffing for 88 cents, Campbell’s canned gravy 2/$1.00 and the large case of Aquafina bottled water for $3.99 (usually it’s around $5-6 at any other store). Last but not least is the ‘new to me’ store for the ‘rest of the goodies’. Knowing my energy levels these days, I think I’m going to break these shopping trips down to 2-3 days, we’ll see. Enjoy your day/night – try exploring the on line grocery ads for something different! Friday “Fun” . . .
Today it’s Friday and I’m now home from my ‘running’ – 10 a.m. radiation treatment (18 more to go, unless they tweak it). 11:30 a.m. found me driving youngest son to the Orthopedist to get a cast on his broken hand (long story – not really worth repeating – broke hand, temporary ‘plate’ put on one finger & temp. splint) today they put a long cast on the hand/arm and ‘return in 2 weeks’ – in and out in about 30 minutes! There is a very well known Orthopedist just 2 minutes from our house and we were given the choice of going to him but I STRONGLY refused – been there before and I know better: 1-2 MONTHS to get an appointment, then at least 3-4 HOURS in the waiting room BEFORE another good 45 min-1 hour when he finally waltzes in – NOT ME! I took a chance and chose a younger doctor that just happens to be across the parking lot from my radiation/cancer center. We got in the very next day! In their waiting room maybe 15 min. while I filled out the initial paperwork; surgery scheduled 3 days later – follow up (today) 4 days after surgery. Waiting room today: not even 3 minutes! (just long enough for me to pull out my knitting and get ONE stitch done), then maybe 3 minutes in the examining room before the doctor came in – exam/cast/out the door in perhaps 35 minutes, tops! HOW’S THAT FOR EFFICIENCY?! VERY pleased and will definitely recommend him to others! This is not the one I use, but very close (note no bumps on the table!). The whole thing is amazing – all the big ‘stuff’ on the right side moves/rotates and the table can go up & down or forwards & backwards (feels sort of like you’re on an amusement ride at times!) There are also ‘arm rests’ (not shown in the photo) which sort of look like stirrups (ladies, you know what I mean) but these are rubber coated and are used to support your upper arm and wrist while in this lovely radiation position-arm over head, bent at elbow; sort of feel like a 1940’s pin-up model’s pose. So far, the treatment is ‘no biggie’ – I’m in and out in anywhere from 10-20 minutes, depending on whether they’re doing xrays that day (and, honestly, I can’t tell the difference from my perspective, except it’s a longer session!). Still have most of my energy, I just have to remember to not ‘over-do’ and take breaks; biggest thing is to get 8 hours sleep, which I’m doing. Next week is Thanksgiving and I’m really hoping my energy levels hold up for all the food prep and cooking – we’ll see. Speaking of the holiday – are you ready with your purchases yet? I’m still ‘waffling’ about where to buy my turkeys (I buy 2 – one for Thanksgiving and one for Christmas). Around here prices range anywhere from $1. ?? a lb. to the lowest I’ve seen: 49 cents a pound IF you spend $25 at their store (they also had another ‘special’: one 18 lb. Spartan-brand turkey FREE if you spend over $100 at their store!). I’ve never shopped there before so I’m still kind of ‘on the fence’ – so far I haven’t seen the 49 cents a lb. prices at the three stores near me – I might just wait until Monday and see what’s available (hope I don’t ‘waffle’ myself into higher prices!). Yes, I’m Scots – AND, as my husband would say – when I’m not within ear range – CHEAP when it comes to spending money! My thoughts on that are: the money I save by carefully choosing where to go, can be spent on other items we also need! I’m currently making up the list of what foods we’re eating (same thing every year Thanksgiving/Christmas). How are YOU doing on your lists/preparations? scoop out middle of mushroom cap. ingredients and cook for one minute. add apples, pecans & cranberry sauce. evenly over firm set jello mixture. Sprinkle toasted pecans on top. Keep chilled until serving time. about 3 quarts water to boil; add beans. bite, about 4-5 minutes; drain. garnish with lemon slices. Serves 8.
toasted & spread is heated through. Cool slightly; serve with crackers. apples twice with syrup from pan. syrup, sprinkle with white chocolate. minutes or until soft & caramelized. Add sage & scrape into large mixing bowl. together and stuff cavity of turkey. 30 minutes until hot & top is crusty. electric mixer until well blended. smooth. Cover & chill 30 minutes. together brown sugar and flour. Â is crumbly, then stir in pecans. three flour & greased 8″ x 4″ loaf pans. It’s a beautiful 52 degree day today – sun shining, slight breeze, blue skies with light, fluffy clouds – great day to enjoy (just before the ‘REAL’ fall hits – at least, in Michigan – which is grey skies, rain and usually pretty stiff winds, quickly followed by the ‘S’ word – ugh!) But I digress – there are tons of great recipes pouring in just before the big “BIRD” day next week, so I thought I’d add a few extra posts for those of you who might still be looking for great things to cook. reserving drippings; cover pork & keep warm. slices on top & serve. Serves 4.
pot, bring to boil & serve. add tabasco if you wish. add corn syrup, beating until well blended. extract; pour into pie crust. slice & serve. Makes 10 servings. turkey 20 minutes per pound. another round on top, sandwich-style. Keep in fridge until time to serve. frozen cranberries for the raspberries. until well blended; spread over crust. toffee bits just before serving. turkey; makes 1 1/2 Cups. Yay, it’s Saturday! It’s been a bit of a rough week but now it’s my day to REST (of course, ignoring the fact that I just got home from tons of running errands, but I digress . . . ). It’s a lovely 52 degrees here, sunny and a light breeze – that directly contrasts to the cold days earlier this week with snow flurries (fortunately it didn’t STICK!). I love late fall days like today; they make you truly appreciate what you ‘had’ with warmer weather during the summer and (not looking forward to) colder days coming very soon. Brought in my little grouping of tiny birdhouses that were on our outside windowsill; I figured it’s easier to just brush off any lose pine needles & leaf bits than wait another few days and bring them in all wet – knowing it’s going to be raining very soon (with snow quickly to follow). I believe I’ve mentioned here in years before of one particular Thanksgiving I remember: I was invited to a young man’s familys Thanksgiving dinner. We drove quite a way to his Grandmother’s house, had wonderful foods and several absolutely scrumptious homemade pies then it was time to leave. I had dressed in a skirt and ‘flats’ (low dress shoes) as it was the ’60’s and that was the dress code for that time. We got outside only to discover that a HUGE snowstorm had hit – had to walk to the car in about 2 1/2 feet of snow -Brrrrr! (hoping that won’t happen this year!). That makes 20 now I’ve knit; just got some nice pink/light blue/lavender yarn today for another batch of knitting! Ok – on to RECIPES! YAY! a meat thermometer reads 170°. Meanwhile, combine butter and honey. (Do not overbake) Cool completely. condensed milk with whisk 2 minutes. any excess liquid drain into sauce. Stir sauce and serve with peppers. bowl; toss with fork until moist. clean. Cool on rack. Serves 10.
cook, stirring constantly, 1 minute. often, 5 minutes or until thickened. juice in measuring cup; add milk. Let stand for 5 minutes then use. and soup. Add onion flakes to taste. Combine with potatoes in slow cooker.